If you snore loudly and often, you know the social implications of your problem. It’s bad enough when your spouse can’t sleep in the same room with you, but when your travel companions stop inviting you places because they can’t get a decent night’s sleep, it may be time for you to do something about it. Even if you have become accustomed to middle of the night elbow thrusts and lots of bad jokes, snoring is no laughing matter. It is a signal that something is wrong with your breathing during sleep. It means that the airway is not fully open and the log-sawing noise that you make comes from efforts to force air through narrowed passageways. Perhaps 1 in every 10 adults snore and for most, snoring has no serious medical consequences. However, for an estimated 1 in 100 persons, habitual snoring is the first indication of a potentially life threatening disorder called obstructive sleep apnoea. Both snoring and sleep apnoea are gaining greater recognition among health professionals and the lay public. 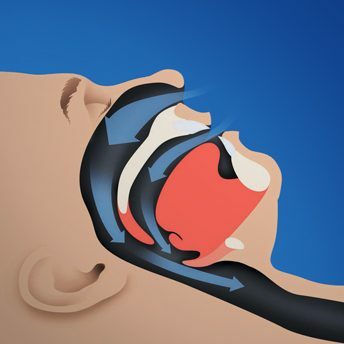 Your FirstBite dentist can play a role in the recognition and treatment of both snoring and sleep apnoea. Many people think that snoring and sleep apnoea are the same thing. This is not true. Snoring, which is caused by the vibration of the tissues due to air turbulence as the airway narrows, may be a sign that a patient is suffering from apnoea. But not all snorers are apnoeics. Mild or benign snoring is characterised as snoring which causes no physical symptoms. A condition known as Upper Airway Resistance Syndrome occurs when the upper airway narrows without closing. This can cause loud snoring and laboured breathing, and while the sufferer may not experience apnoea episodes, they can still wake numerous times through the night. This leaves them unrefreshed and tired throughout the day. On the other side of the spectrum lies the snorer who suffers from sleep apnoea. They may stop breathing up to 100 times each night, which not only affects how they feel in the day, but poses a risk factor for serious health problems like stroke, heart disease, diabetes and depression. 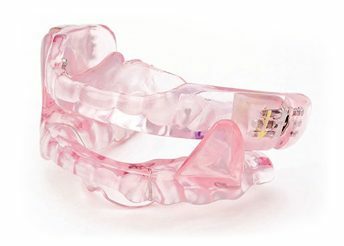 Snoring can be successfully treated using dental appliances (usually splints), which have the advantage of being inexpensive, non-invasive and reversible. They are also regularly used in both the diagnosis and treatment of obstructive sleep apnoea. Appliances are particularly appropriate for those patients who cannot tolerate CPAP (Continuous Positive Airway Pressure) therapy. When surgery is contraindicated or the patient is unwilling to go through a surgical procedure, appliance therapy may also be appropriate. Only a specially trained dentist can properly select the appliance that is right for you. If snoring is interfering with your life, come and see us at FirstBite Dental for a comprehensive assessment.